Frankly, the Nokia Lumia 900 looks exactly like the Lumia 800 from before, but to say it bluntly, it’s just, well, you know – BIGGER! Sporting that same lovable unibody polycarbonate design as its smaller-sized sibling, it’s absolutely a pleasure to behold since it’s still so foreign looking when compared to everything else out there. Sure, some of us might think and wonder for a moment as to why they didn’t go with a new design, but to tell you the truth, this is how Nokia is going to distinguish its Lumia line from everything else. All in all, it’s still one fantastic and chic looking device that embodies a lot of hip qualities. Just like the Lumia 800 we reviewed late last year the new 900 features the same 1.4 GHz single-core processor, but don’t let that fool you as this device is screaming fast and exceptionally fluid. You can see from the video below the 4.3-inch AMOLED WVGA display is very vivid and bright. I was only able to hold it for a brief moment before it was yanked from my prying fingers but it feels great. The soft-coat matte finish is wonderful to say the least. The Lumia 900 features an 8 megapixel rear camera with LED flash, 2 MP front for video. And all those essential Nokia apps such as Nokia Drive and Nokia Music. Current Windows software limits the camera to just 720p video but its 8 megapixel lens should take great photos if it’s anything like the 800 before it. All this is wrapped in a single-piece polycarbonate casing with an 1,830 mAh battery for all day usage. Nokia did mention this was a prototype without final software but things ran smoothly from what we saw. Neither AT&T or Nokia have released any details on a release date or pricing other than “in the coming months”. Stay tuned as we’ll have more details soon and be sure to get a full review as soon as possible. Las Vegas, US - Today at the 2012 International Consumer Electronics Show (CES), Nokia and AT&T announced the Nokia Lumia 900, the first of Nokia's Windows® Phone-based range to feature high-speed LTE* connectivity. 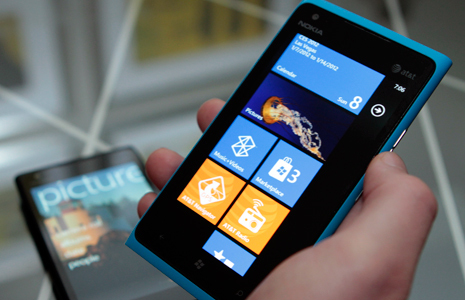 With Nokia's largest display, the Nokia Lumia 900delivers a rich content experience from a phone that still fits easily in your hand. *Limited 4G LTE availability in select markets. 4G speeds delivered by LTE or HSPA+ with enhanced backhaul, where available. Deployment ongoing. Compatible data plan required. LTE is a trademark of ETSI. Learn more at att.com/network. **U-Verse Mobile: Access to select content requires qualifying U-verse TV plan or monthly subscription fee, and WiFi connection and/or cellular data connection. Available content may vary by device and/or U-verse TV subscription and is subject to change. Data charges may apply.